Handmade City at Steeple Square! Here it is, the amazing vendor list for our upcoming holiday event Nov. 19, 2016 from 10am-5pm at Steeple Square! As usual, we have a great collection of makers ready to take over the Steeple for Handmade City! Here it is, the amazing vendor list for our upcoming holiday event Dec. 5, 2015 from 10am-5pm at the Figge art museum. As usual, we have a great collection of makers ready to take over another venue for Handmade City! Sponsored by FIGGE Art Museum (our venue) and Crafted QC. Special shout out to Shutterbooth.com for providing sweet pics. Who’s ready for another badass show? We are! Click the thumbnail on the side bar to download a printable version of this flyer. See you there! First up in our HMC8 spotlight series is our awesome venue and it’s current residents the Quad Cities Food Hub & The Front Street Brewery. What makes our upcoming holiday event one of the best shows we’ve held is the fact that we get to share a space with these two Quad City establishments. In short our friends at the Food Hub bi-state are an initiative working to strengthen the connection between locally grown food, the farmers who raise it, and the consumers who eat it. Their local market store is located inside the Davenport Freight House and carries regional items you can’t find anywhere else in the Quad Cities. Inventory grows weekly and during Handmade City sow hours you will be able to shop the Food Hub’s local and regional natural health foods, along with unique specialty items! To learn more about the QC Food Hub visit their website: www.qcfoodhub.com and check out their Facebook Page. Front Street Brewery has served the fine community of Davenport, Iowa for over 18 years and is the oldest brew pub in the state of Iowa. Their Tap Room is located inside the Freight House and will be serving hand-crafted beer through out Handmade City show hours. We can’t wait to see what they have in store for a holiday brew! To learn more about FSB check out their pretty website: frontstreetbrew.com and add their Facebook Page to your list! Our upcoming Holiday 2014 event is going to be bonkers! We have over 40 super talented vendors and will be setting up shop downtown Davenport inside the historic Freight House. 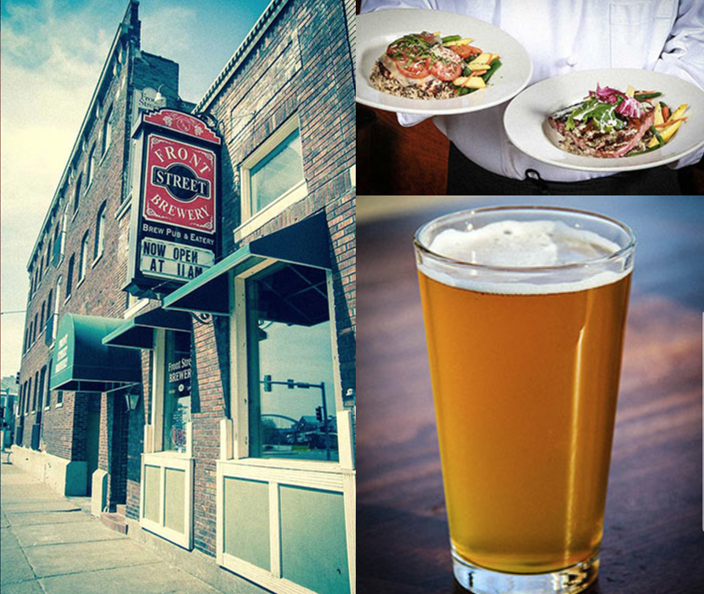 The Freight House is home to the Quad Cities Food Hub and the Front Street Brewery Tap Room. During our event you can shop handmade gifts, organic food products and enjoy locally crafted beer all in one stop! Handmade City pairing with these two local organizations makes for a great shopping experience! We have added our amazing vendor list below as well as a little info about the Food Hub & Front Street. Help us encourage our community to support handmade artisans. Share our site and Facebook event! Check back here and on Facebook for more information very soon. we will have a DJ and some live music, as well as a few giveaways and special surprises! Quad Cities Food Hub – A sustainable local food system fostered through community partnership. A bi-state initiative – the Quad Cities Food Hub connects farmers and consumers in Iowa and Illinois in effort to augment regional local food production and consumption. The organization is part of a network of Regional Food System Working Groups in the state of Iowa. Front Stree Brewery – The oldest brew pub in the state of Iowa, is nestled beautifully along the bank of the Mighty Mississippi. It has served the fine the QCA for over 22 years. It’s where Davenport and thousands of visitors from other cities come for great times, great food and fabulous brews made right on the premises in Front Street’s Brewery. 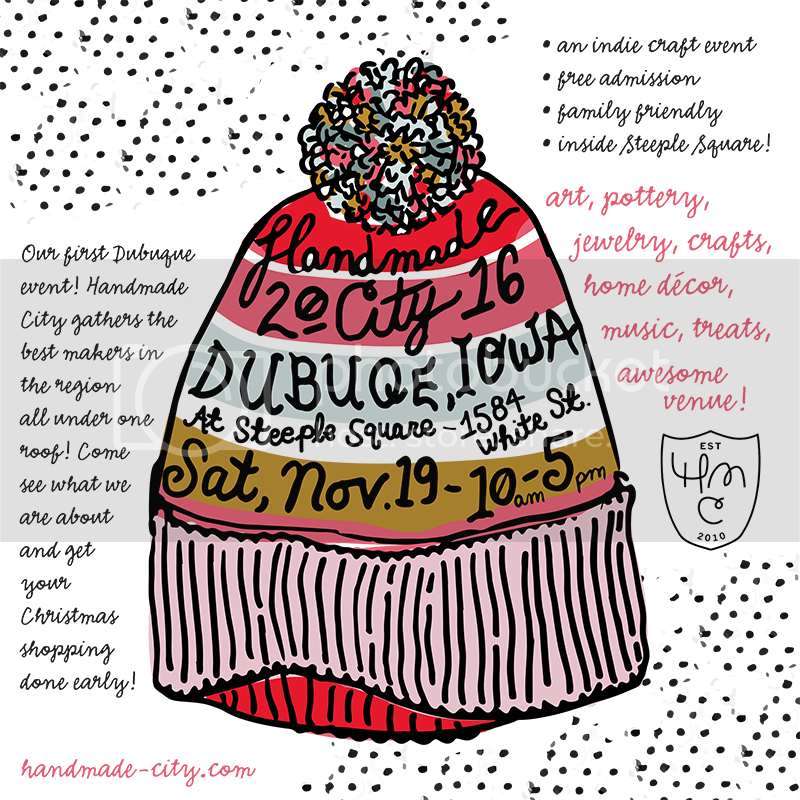 HMC7 – Handmade City Holiday 2013! We are looking forward to our next event! Over 30 vendors will set up shop in downtown Davenport inside the Sky Bridge. Check out our awesome vendor list below and help us spread the word by sharing our site and facebook event! We will be posting more details about our holiday event very soon so check back! Until then, happy crafting! Get excited because this an awesome vendor line-up!! 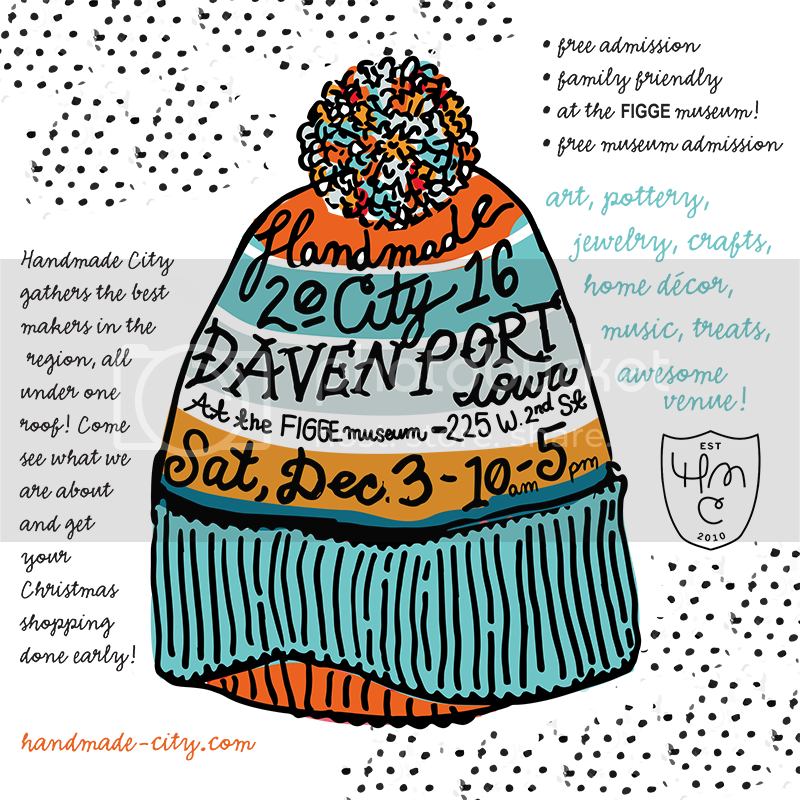 Our biggest show yet as we host over 30 mega-talented indie arts & craft vendors all in one sweet venue- the Davenport Sky Bridge! Handmade City 6 is gonna be amazing! APPLICATIONS ARE OPEN TIL MARCH 31! 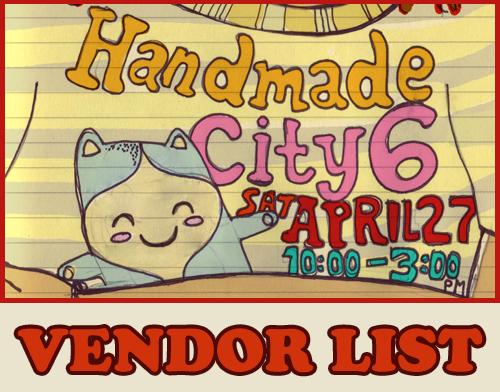 We will be posting the vendor here on list April 8! For more information on applying click HERE. We are super excited to be hosting an event in the Downtown Davenport Sky Bridge, it is a great space and we think you will love it! Stay tuned, this will be a really fun event! Well wasn’t long after our last show ended that Downtown Davenport Partnership asked if we would be interested in being a part of their “ICEstravaganza” festival this January. A long holiday cleaning up our craft spaces, sending out our thanks to all who helped with HMC5 plus a few emails & calls later and… Voila! 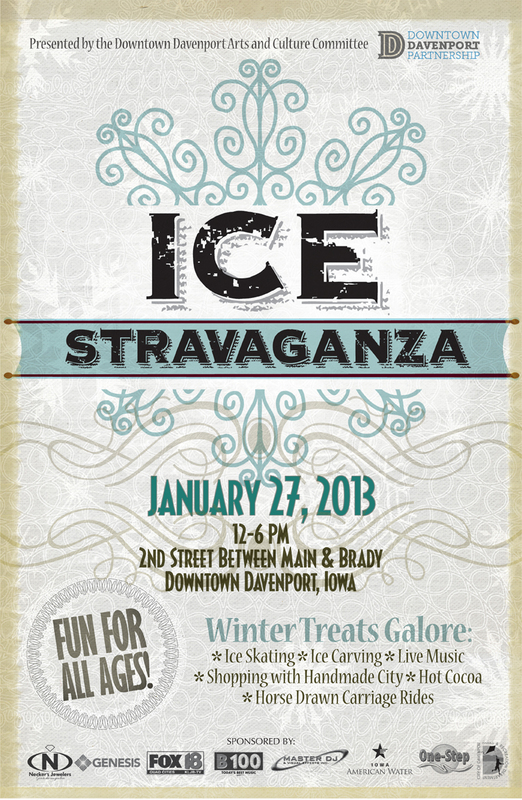 HMC will be taking over the Sky Bridge in Downtown Davenport (2nd Street, between Brady & Main) during “ICEstravaganza” on July 27th, from 12pm–6pm! 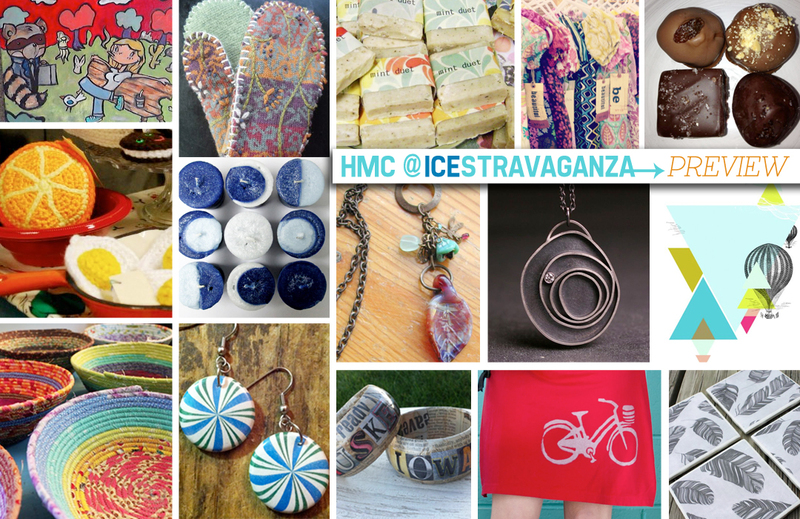 Join us for some handmade shopping and loads of fun family filled activities including our HMC make&take Valentine craft table, ice skating!, free giveaways, hot cocoa and more! Please invite all your friends. This is a family friendly event with lots of fun things to keep kids AND adults occupied on an otherwise boring winter day! Keep up-to-date with us on Facebook and visit our Event Page HERE. We will be posting more great pics and details here on our site as we near closer to the date! Happy Crafting!